Tim Ma’s parents came to the United States from Taiwan in the 1970s. They opened a restaurant. It was not a success. They found success in America, however, in computers and engineering. In part because of their own experiences, Ma’s parents hoped he would study to become an engineer or doctor. They wanted financial security for their child. Ma grew up in the southern U.S. state of Arkansas. He says the American South was a challenging place to live for a Chinese-American kid in the 1970s and 80s. Ma did well in math and science classes in high school. And he ended up choosing to study electrical engineering in college. Several engineering jobs later, though, Ma had a change of heart. He wanted to leave the engineering world behind and enter the restaurant business. It was in his blood. After all, his parents had owned a Chinese restaurant in Arkansas. His uncle also owned one in New York. Ma has a clear memory of when he decided to open his own restaurant. His parents, Ma says, could not understand why he would want to leave such a good job to open a restaurant. They had worked long hours but their own restaurant still failed. But Ma remained certain. He was going to do things differently than his parents. He was able to learn from their one major mistake as restaurant owners – they knew very little about the art of cooking. He believes the mistake caused the restaurant to fail. 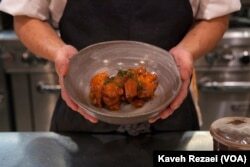 “My parents knew nothing about cooking and they knew nothing about owning a restaurant. They had this chef that was very, very good and he was making excellent food, but then the chef start(ed) to see a lot of money come in, the chef saw that and was like ‘OK, I’m going to go across the street and open a Chinese restaurant’ and it really put my parents in a bad situation,” he says. So, at age 30, Ma left engineering and returned to school – cooking school. He wanted to study the fundamentals of cooking so that he could work as a chef in his own restaurant. Ma enrolled at the International Culinary Center in New York. He received training in French cooking. Ma soon learned that he enjoyed cooking. He discovered it was similar to engineering. In 2009, Ma opened his first restaurant in Virginia. It is called Maple Avenue. The restaurant serves American cuisine. He set up the place with help from his wife, parents and friends. He used tables and chairs left behind from the previous owner of the restaurant space. At Maple Avenue, Ma cooked, cleaned the ovens, fixed equipment and paid bills. He worked long hours, seven days a week. “I don’t have a repairman, so I’m the guy. I know way too much about plumbing, equipment repair,” he says. His long hours paid off. Ma opened his fourth restaurant last year, Kyirisan in Washington, D.C.
For Ma, Kyirisan is a special name. It comes from his old family name, kyin, and the Chinese words for one, two, and three. The numbers represent his three children. "And we just pushed it all together and called it Kyirisan." 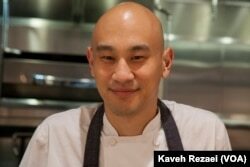 He mixes his training in French cooking with his Chinese heritage to create new dishes. A popular dish is a seared scallops with coconut risotto and basil ice cream.